There are quite a few different internet scams out there, and I have talked about a few of them before. But I keep hearing about people who get ripped off by the “Money Order” scam. You place an ad on Craigslist to sell your used car. You list a fair price. A person calls you from far away and says they have been looking for just this car. So much so that they do not even need to see it - they will send you the money forthwith and even pay to have the car transported. All you need to do is sit back and cash the money order. This is the point where the scam can head in a couple different directions. One I heard of recently involved the money order being sent to the seller for the amount of the car and the cost of shipping. Would the seller be so kind as to call the shipping company and arrange the pick up and pay with the money which was included in the money order? The number of the shipping company was fake - run by the “buyer” who would just pocket the money. Or, the money order is for too much but the buyer owes money to a friend who lives nearby and will be picking up the car. Can you give the overage to the driver when he picks up the car? 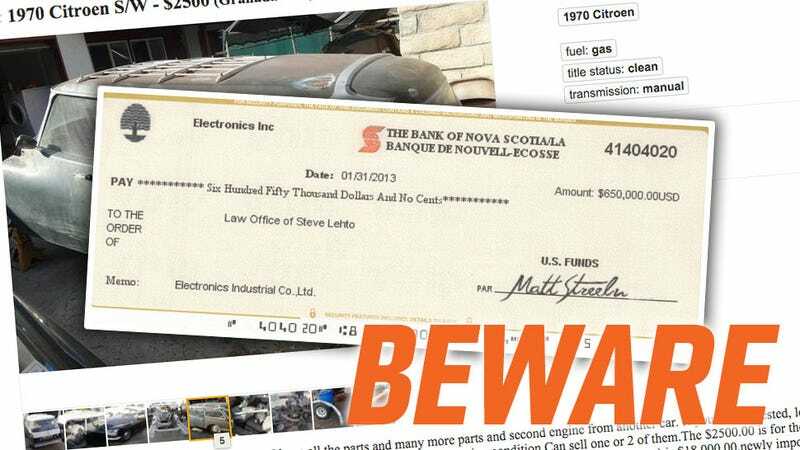 The nucleus of each of these scams is that the check or money order is counterfeit. Anyone with a scanner and a color printer can knock off real-looking checks and money orders. When you take one to your bank, they will often process it as if it is real. When it works its way through the system, the instrument gets kicked back somewhere upstream and sent back to your bank. Your bank then reverses the whole process - except you are now out any money you handed over to the shipper, the driver or the out of country client. This scam works because it preys on the desires of the seller (or attorney) who wants to close a lucrative deal quickly. When someone comes along and offers to throw money at you, who are you to get all skeptical? When someone sends you a money order or other instrument which is purportedly good-as-cash, check it out carefully, I have gotten these (I often screw with the people who try to do this to me) with misspelled bank names. But if the paper looks legitimate, ask your bank how long it will be before you are certain it has cleared its issuing bank. Don’t release anything (funds or the item you are selling) until after that date has passed. You might also want to call the issuing bank to see if the account exists, the instrument is legitimate and so on. Trust me: They will tell you. In the past, all the contacts I have dealt with claimed to be in Asia with need of legal services in Michigan. They then Fedexed counterfeit checks to me from Canada. None of it made sense but they were hoping I’d jump all over that huge fee I got for nothing. And getting $216,000 for doing nothing is probably similar to the way you’d feel if someone offered to pay the asking price for your PT Cruiser which only needs “a little work” to get running.